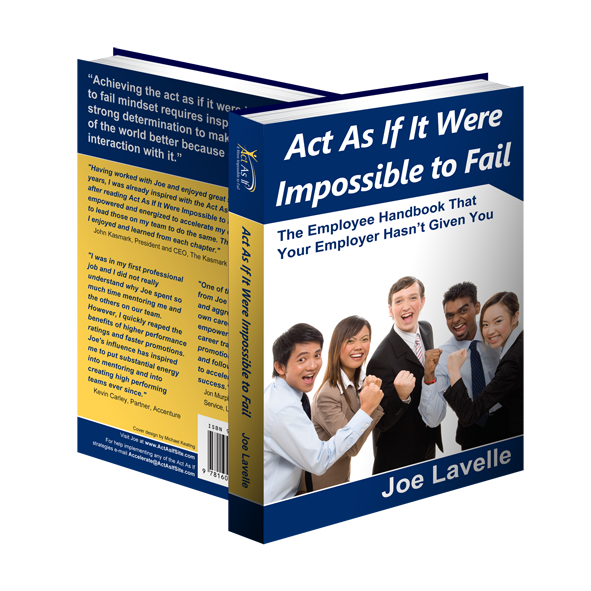 Get the paperback or Kindle version of Act As If It Were Impossible to Fail by clicking on my book in the Amazon box here! The book provides the strategies that you need to know to advance your career more quickly but were not taught in college or by your employer. The strategies have been developed, observed and nurtured through many years of experience and research and are offered with advice for practical application without complicated theory to memorize. The book is intended for all professionals that would like to accelerate their career via faster promotions and increases in compensation. The book is applicable in every economic climate, especially in the current recession.